Pirasteh's imagery explores spaces without boundaries. These are uncrowded spaces, unpolluted, with a minimum of detail. Solitude and loneliness abound. The influence of Iranian landscapes takes prominence with the distortion of hues and the colour blue, creating breathtaking atmospheres. Her landscapes express powerful emotions showing an exceptional range and quality, her dramatic monochrome photographs are often combined with paint, collage, and other media as vehicles of self expression and mood. She recreates the world with her own visual language, images that are melancholy, desolate, beautiful and sometimes idiosyncratic. The Cultural Centre, Javea, Alicante, Spain, 1994-1997. The Cultural Centre, Jesus Pobre, Alicante, Spain, 1995. Galeria La Guardia, Javea, Alicante, Spain, 1995. Atelier Uno, Javea, Alicante, Spain, 1995. The Cultural Centre, Teulada, Alicante, Spain, 1996-1997. The Changing Room Gallery, London, 2002. The Deutsche Bank in collaboration with Street Cred charity, London, 2002. Conway Hall, International Women's Day Celebration, London, 2005. E17 Art Trail, London, 2005. Walthamstow Festival, London, 2006, display in Mall Shopping Centre. 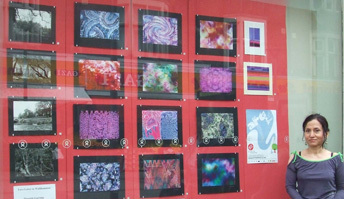 E17 Art Trail, London, 2007, Oxfam shop window (a percentage of sales donated to Oxfam charity). (click to view image). City Hall, DecarbonART, London, 2008. Soho20 Chelsea Gallery, New York, 2008, participatory installation. Vestry House Museum, London, 2008. Head Space & Egg Space online exhibition, Liverpool, 2008. City Hall in collaboration with Trees for Cities charity, London, 2008. Margate Harbour Arm Gallery, art auction for Teenage Cancer Trust, Margate, 2009. Gallery at Willesden Green, BAR fundraising event, London, 2009. Brent Affordable Art Fair, London, 2009. Yinka Shonibare's Space, Christmas Market, London, 2009. St John's Wood Church, Christian Aid Art Exhibition, London, 2010. Affordable Art Fair, shortlisted for The Cass Art Prize, London, 2011. The Mill, exhibition organized by The Friends of the William Morris Gallery, London, 2012. New Space Gallery, London, 2012. Photographs published in "International Contemporary Artists" vol VI, 2013. Museum of Young Art, International Art Fair, Vienna Showcase, 2013. The ING Discerning Eye Exhibition, Mall Galleries, 2013. The 17th Annual Postcards From the Edge - Visual Aids, New York, 2015. Photographs selected for US publication : International Photography Annual 3 - Manifest, 2016. Menier Gallery, supported by National Tremor Foundation, London, 2016.